But conveyancing stamp duty has been the canary in the coal mine, says Gavin R. Putland. From the National Accounts, Table 18, we may compute the revenue contributions from selected taxes as percentages of GDP. The following graph shows how these contributions have varied over time. Federal taxes are in the top half and State/local taxes in the bottom half. Revenue and GDP figures are both seasonally adjusted. 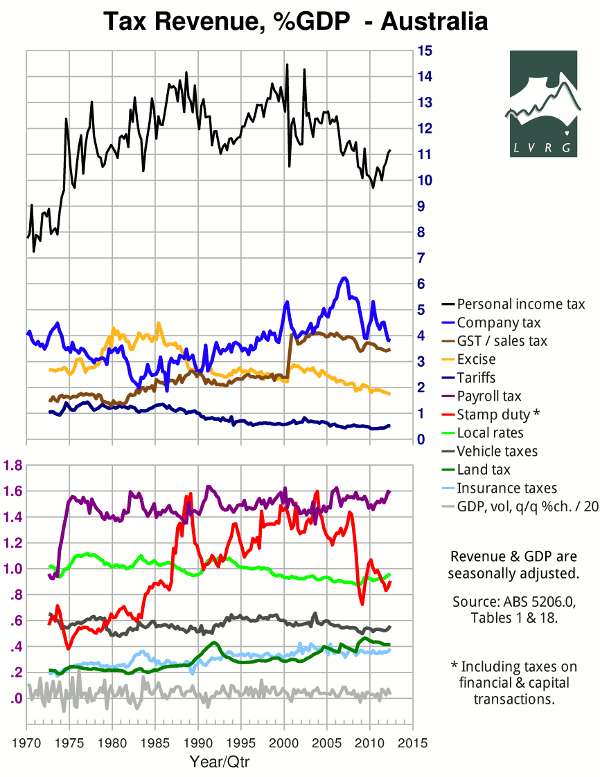 The most salient feature of the graph is the expanse of white space between personal income tax and the rest. And about 90% of personal income tax is on wages and salaries, which are fruits of labour. For this writer, the second-most salient feature is that the mid-70s recession, the early-90s recession and the “GFC” were preceded by steep falls in receipts from taxes on financial and capital transactions. These are mostly conveyancing stamp duty (especially since the introduction of the GST) and are therefore a proxy for turnover in the property market. A related observation is the extreme volatility of stamp-duty revenue, on which the States foolishly rely for a large portion of their funding.